Introduced in 2013, the Fleurier Amadeo® 7-day Skeleton Tourbillon is the first skeletonised Tourbillon among BOVET ‘s Fleurier collection. This timepiece manufactured by Dimier 1738, Manufacture de Haute Horlogerie Artisanale, is a new anthem to the decorative arts. The use of three-quarter plates already allows a great deal of light to pour through the tourbillon carriage. This further increases the mechanical density in the upper section of the movement, especially since the latter houses the two traditional barrels supplying sufficient energy to ensure a 7-day power reserve. A first glance at this timepiece gives a clear idea of the efforts that must have been expended by the watchmakers in achieving such a result without making too many technical concessions. This is particularly true given the vulnerable and delicate nature of openworked movements, and particularly of their escapement. Engraving artisans traditionally receive sets of openworked bridges and mainplates and decorate their surfaces by following the cut-out shapes. In this case however, Pascal Raffy and his teams took a different approach to this timepiece in order for it to achieve aesthetic excellence without reducing its reliability and its precision-timing performances. The secret of this successful accomplishment stems from the fact of having jointly entrusted the design of the skeleton working to watchmakers – for the technical aspects – and to engraving artisans. By incorporating technical constraints into their aesthetic endeavours, the latter were able to endow the plates and bridges with cut-out shapes designed to make a perfect match with the Fleurisanne engravings that they would then execute on the surface of each component. Movements crafted by DIMIER 1738 (BOVET’s Manufacture de Haute Horlogerie Artisanale) are notably distinguished by their ability to highlight volumes. The aesthetic and the decoration of the movements are always conceived in three dimensions. The skeleton Amadeo® Tourbillon represents the ultimate expression of the use of volumes that in make it more a sculpture than a decorated mechanism. The cut-out shapes of the parts, their engravings and the contrasts between the different surface states accentuate the complexity of the mechanism and magnify each detail. 7-Day Skeleton Tourbillon Despite the sophistication of its skeleton-working and its decoration, the Amadeo® Tourbillon nonetheless remains a reliable, functional and accurate timepiece well suited to daily wear. It displays the hours and minutes as well as the 7-day power reserve, and the seconds hand is carried on the upper pivot of the tourbillon carriage. The reversible and convertible reverse hand-fitting also shows the hours and minutes via off-centred hands on the second face of the timepiece. This reversed hand-fitting appears on the only dial of the Amadeo® Tourbillon. It is in fact a guilloché chapter ring which, in harmony with the finest tradition of skeleton movements, features an open centre providing enchanting views of the mechanism within. 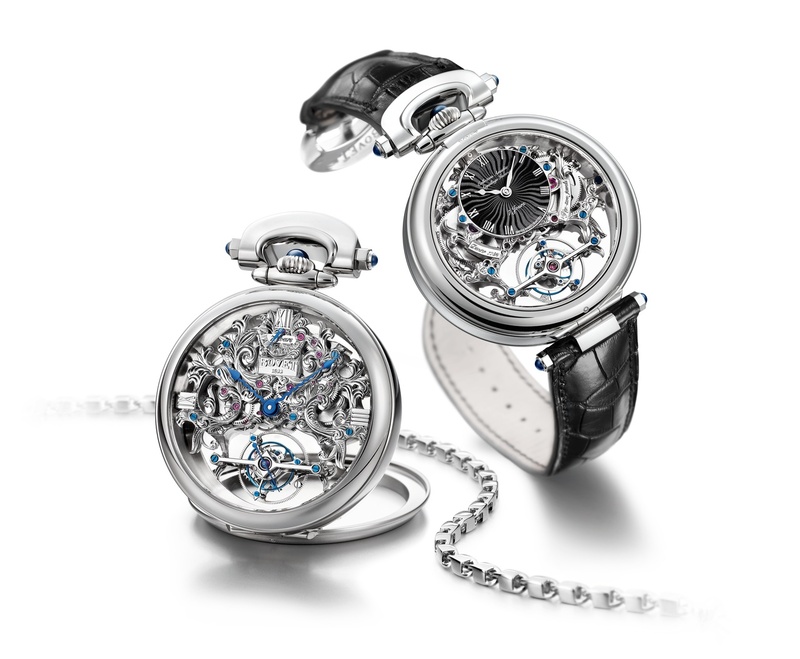 In addition to the extraordinary dexterity of the artisans who have succeeded in “fashioning” this timepiece while making no technical concessions, it is worth noting that the specialists of the Technical Department within the Manufacture have brilliantly succeeded in avoiding the other pitfall of skeleton-worked movements: namely readability. To provide a sufficiently clear framework of reference, three Roman numerals are visible on the movement at 12, 3 and 9 o’clock. According to the collector’s wish, the movement is given a gold-plated or rhodium-plated coating. Meanwhile, the sprinkling of blue accents of the hands, the screws and the balance rim creates a striking overall contrasting effect that endows it with graphic strength and exemplary readability.